In the Meantime...: pink candles. Happy Advent, friends and neighbors! I've taken a bit of a hiatus from writing lately. Even my coworker and a friend asked me recently, "have you written anything lately?" I sighed with a "no." It's not that I haven't wanted to. I just feel like I have little to say lately. My season of waiting has surpassed my insight about the topic....just in time for Advent. I don't know that many people know this, but I'm not a huge fan of Christmas. I could do without the music and decorations. It all just seems like a bunch of work for little reason. Call me your regular Shelly Scrooge. I saw a quote on a video recently that said, "if you're tired of Christmas by the 24th, you haven't celebrated Advent well." That made me get to thinking. It is a pretty cool time of the Church year. It's like getting the party going so that it's at its peak when the Guest of Honor arrives. This is a unique time that is simultaneously all about joy and all about waiting. We a whole season of celebrating and looking out the window to see if His car has pulled into the drive. An Advent tradition that may be sort of strange if you aren't familiar is the Advent wreath. It's a decoration with 4 candles, one for each week of Advent. 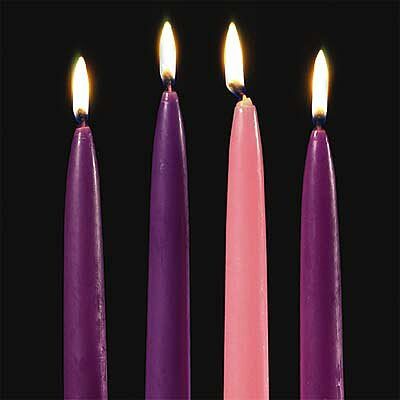 Each week, we light one candle and it leads us through the process of Advent. I love applicability of the Advent wreath. Think about that party that's getting warmed up for the Guest of Honor. As more and more guests arrive, more lights in the house get turned on. As the arrival of the Guest of Honor draws near, we work our way up to all the lights in the house being on. The wreath works the same way. As we go along, all the candles on the wreath will be lit, ready for the King to arrive. My favorite part is the pink candle, though. Not because it's my favorite color or anything, but for what it represents. The pink candle gets lit third with one week in Advent remaining. It is lit on Gaudete Sunday which literally means "joy." In this building time of celebration, the pink candle gives us an extra burst of joy to really amp up the party. It's like the wreath was designed to get us through the long season of waiting. When it begins to get a bit long, the pink candle on Gaudete Sunday says, "He's almost here!! Stay ready! Get excited!" It's Clark Griswold flipping the switch on his outlandish light display. This is really what keeps us going. I'm reminded of when I ran a 5K a couple of months ago. The race organizers place encouragers a quarter of a mile from the finish to say, "you're almost done! Give it all you have!" That's our pink candle. Advent is a marathon and the pink candle says, "you're almost done, finish hard." You run faster than you thought you could because of adrenaline and enthusiasm and it is exciting. I think this is true in my life right now. I'm in a season of waiting. Who knows for how long. BUT God is good and working. Sometimes, I just want to walk in this race. Sometimes I just want to put away the candles on the wreath, but throughout this time, He gives me pink candles that encourage me to stay the course. I have friends who remind me. "Keep waiting. What's coming is good. Be faithful. God is good. Lean on Him. Grow with Him." I have God's Word and His working that reminds me to seek Him first and all things will be added. He grants me relationship and encouragement both from His Word and from other people. They are my pink candles that urge me on. When it feels like the purple candles are endless, I get surprised by the pink candles that seem to appear from nowhere. They are the sparks that remind me of hope and joy that are both now and not yet. To the pink candles in my life, thank you. Thank God today for your pink candles. He is faithful to give them and to encourage us on our journey of life with Him. I can't wait for the pink candle to be lit this Advent. I can't wait for the Guest of Honor to arrive. But in the meantime, I shall attempt to be the pink candle for others. May we be grateful for the pink candles.